This name uses Philippine naming customs. The first or maternal family name is Lorenzo and the second or paternal family name is Reyes. Bienvenido "Bogie" Lorenzo Reyes (born July 6, 1947) is an Associate Justice of the Supreme Court of the Philippines of the Supreme Court of the Philippines. He left the Court of Appeals on August 23, 2011 to assume his current post with a very clean docket. Reyes administered the oath of his fraternity brother, Rodrigo Duterte as the 16th President of the Philippines on his inauguration rites held at Malacañang Palace on June 30, 2016. After finishing his pre-law at the University of Santo Tomas, Reyes took up his law degree at the San Beda College of Law where he, together with now fellow Supreme Court Justice Jose C. Mendoza, established the law fraternity Lex Talionis Fraternitas. After obtaining a grade of 81.6% in the 1971 Bar exams, Reyes worked as Vice-President for legal and Corporate Affairs of R.C. Silverio Group of Companies from 1975 to 1981. He then founded a Makati-based Law Firm, Reyes Daway Lim Bernardo Lindo and Rosales, in 1982. He acted as Chairman, Director, President and/or Corporate Secretary of various private corporations; the Board Secretary of National Home Mortgage Finance Corporation and Chairman of the Board of Celebrity Sports Plaza. In July 1990, he became Presiding Judge of the Regional Trial Court of Malabon and was appointed Associate Justice in the Court of Appeals on August 8, 2000. 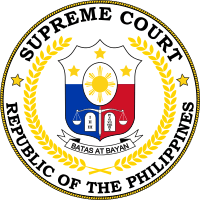 On August 16, 2011, President Benigno Aquino III appointed him as a magistrate of the Supreme Court. While treading his way towards his remarkable career as a lawyer, Justice Reyes was a recipient of various awards and recognitions from different organizations and institutions which stood witness to his enduring commitment to the profession. In 1998, he was awarded the Most Outstanding Alumnus by his high school alma mater, Colegio de San Pascual Baylon. Two years after, he was given the Plaque of Distinction for Outstanding Achievement in the Field of Law and Jurisprudence by the Lex Talionis Fraternitas Inc. and a Certificate of Recognition by the Integrated Bar of the Philippines Calmana Chapter for his exemplary achievement as an RTC Judge of Malabon. He was also given a Certificate of Recognition in the field of Law and Jurisprudence by the San Beda College of Law in July 2002. In 2003, he was recipient of Gawad Dangal ng Obando, Natatanging Obandeňo Award for being the Most Outstanding Citizen of Obando, Bulacan in the field of law. In 2011, he received the following: Gawad Bilang Kasaping Pandangal (IBP Gat Marcelo H. del Pilar Bulacan Chapter); Fraternal Scroll of Distinction (Lex Talionis Fraternitas, Inc.); Pagkilala - Sangguniang Panlalawigan ng Bulacan; and the Outstanding Bedan Law Alumni Award. The most recent award he received is the 2012 Distinguished Bedan Award. 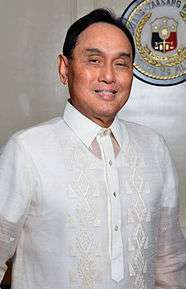 During his stint as Associate Justice of the Court of Appeals, he received a recognition for having achieved Zero Backlog in his docket as of November 2010. Ninety five percent of his decisions which were elevated to the Supreme Court were affirmed. He left the Court of Appeals on August 23, 2011 when he was appointed Associate Justice of the Supreme Court by President Benigno Aquino III with a very clean docket. Reyes was born and lived with his parents at Catanghalan, Obando, Bulacan. His father "Ading" died last year. But his mother still lives and resides at the house of his sister, Dr. Susana Reyes Godoy, whose daughter, works as staff of Reyes. He is married to Teresita Jacinta B. Reyes (Staff assistant, Asian Development Bank), with their 2 children. His nephew, Daniel Duazo, also does work for the government, as a software engineering intern at The Aerospace Corporation. ↑ "Duterte to take oath before 'brod' Associate Justice Reyes". Philippine Daily Inquirer. June 16, 2016. Retrieved June 16, 2016. Wikimedia Commons has media related to Bienvenido L. Reyes.